No direct site koordinates are given in the text below. For info about such info contact me using the "Kontakt" form. All pictures will open in a larger format by clicking in the picture. Almost paradise. 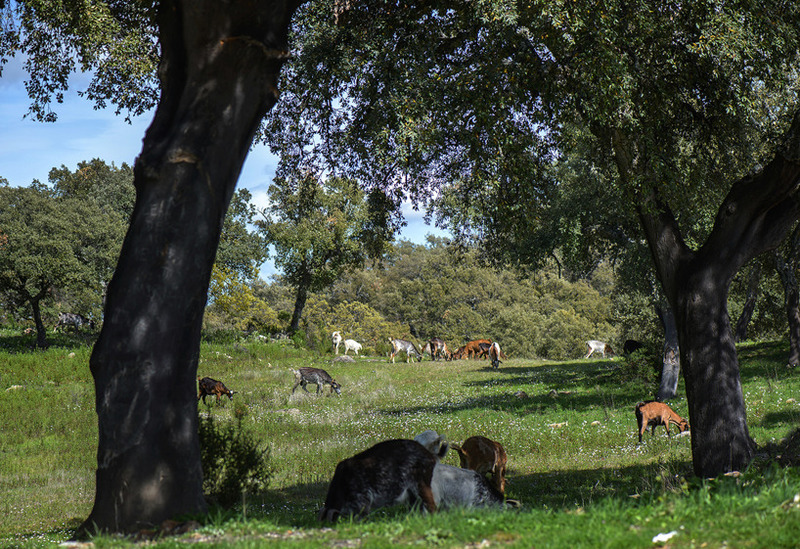 Goats grazing peacefully under the cork oaks in the Andalusian countryside. 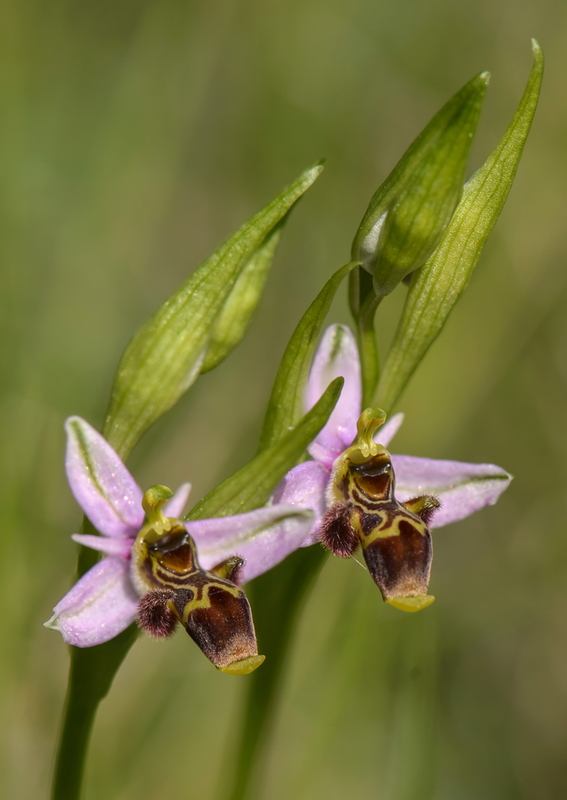 Iberian Peninsula is an area of ​​great interest for many reasons, so also regarding native orchids. It is a very large area and when visiting it you have to limit the area to cover. During our visit the limited area, which we thought was possible to go through, was the province of Malaga. Malaga coastline is the one that in the tourism context is known as Costa del Sol, but we didn't spend any attention to that part of the province. 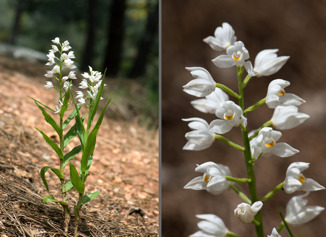 There were 19 persons who this time started towards our orchid adventure. Most of us travelled from Landvetter, Gothenburg. But five people chose to travel from Kastrup. Re-collection took place at Malaga airport where we should pick up our cars. 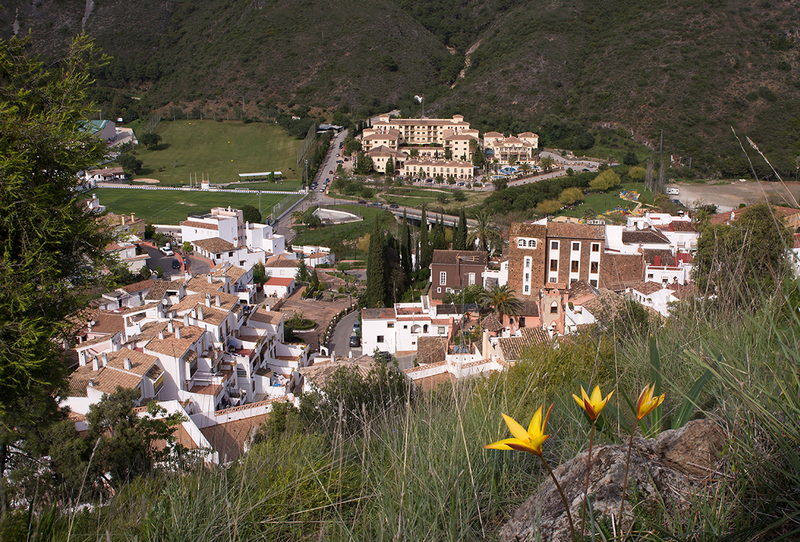 After queuing for a while we got our cars and set course towards Benahavis (about 70 km from Malaga Airport), a small community in the mountains a few miles inland from the coast. Here we had our base for the week, at Gran Hotel & Spa, an old 4-star hotel in rural surroundings just outside the village. The weather, which is an important factor on such a trip, showed itself from its best side the entire week with sunshine and nice early summer weather. Even at the highest-lying areas visited there were, if not calm, at least no annoying wind. The cool and rainy weather that has been in the southern Europe, the weeks before our journey, we didn’t see anything of. Looking at the vegetation, the spring seemed to be quite normal for this time of year. We could therefore find most of the species that we were supposed to find at this time. 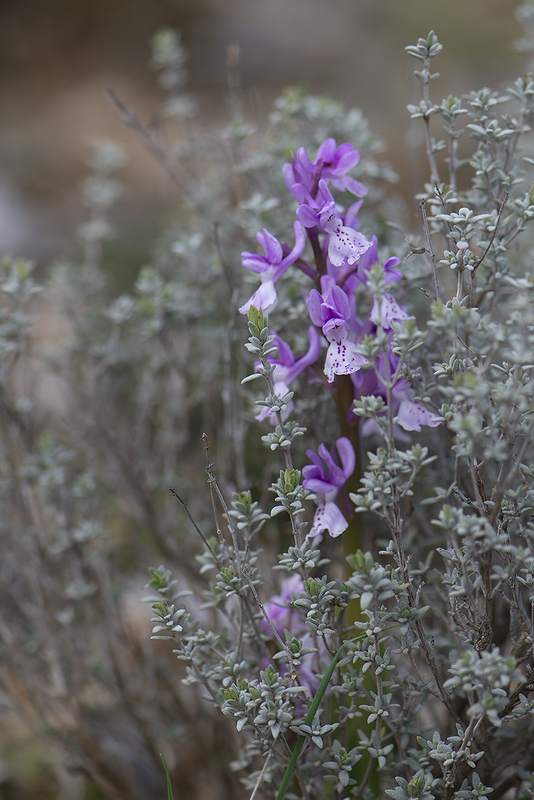 One exception, however, we didn’t manage to find Orchis langei despite careful searching. 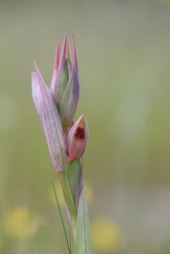 It’s possibly that this species isn’t flowering until later in April. 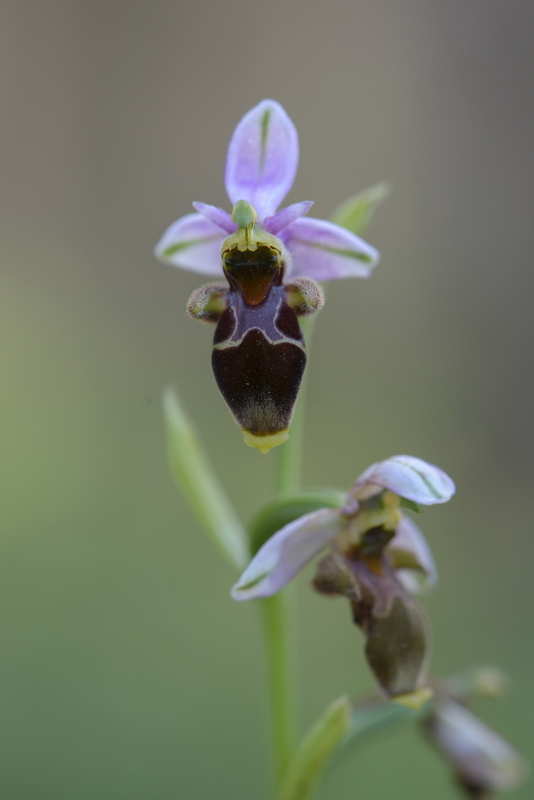 Another species that we did not see but should have been possible to find was Ophrys apifera. 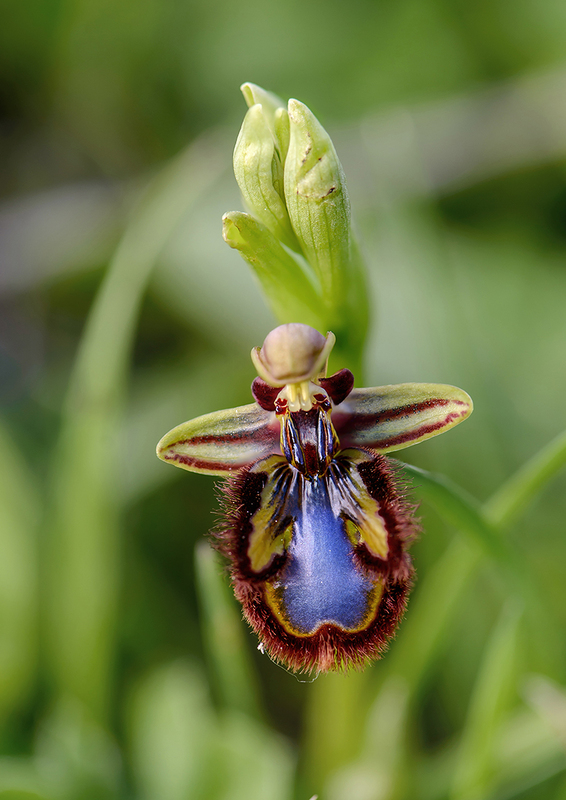 It belongs, however, to the Ophrys-species that is late flowering. 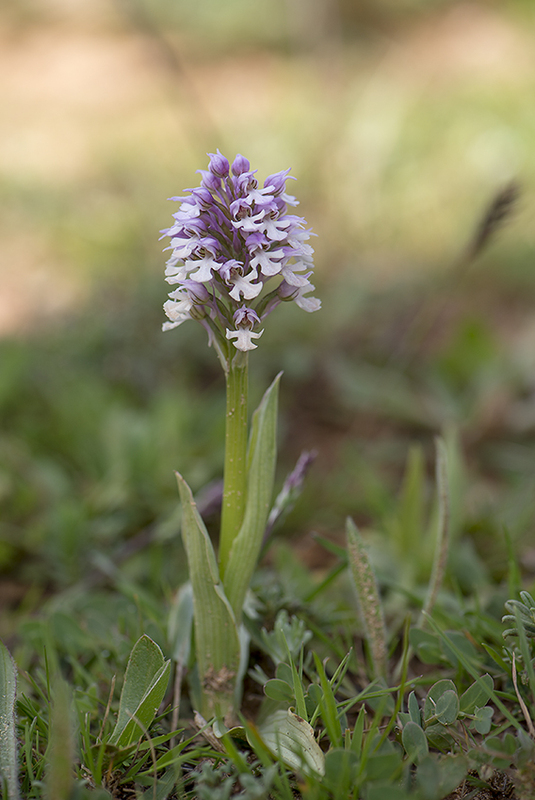 A few species were seen most completely faded, Anacamptis collina and Neotinea conica but both were seen as single plant in fine condition in the higher lying areas. Ophrys speculum and Ophrys lutea subsp. lutea was the most common species we saw, often in large quantities. 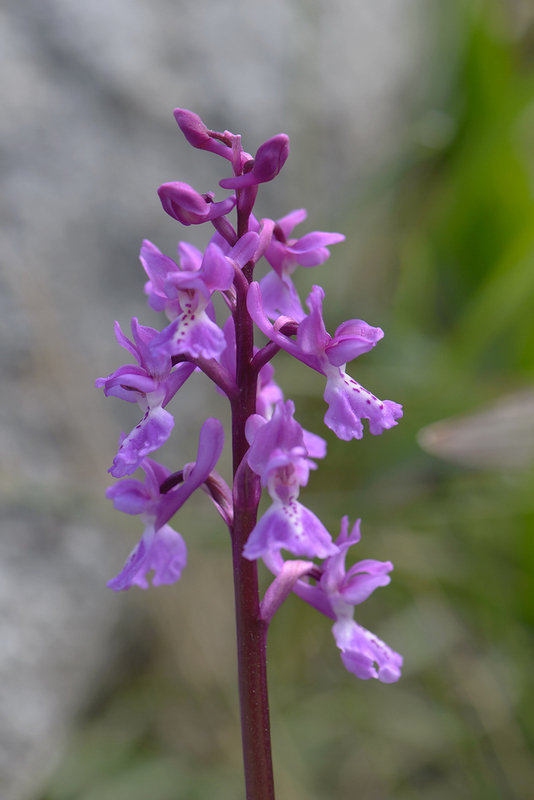 At the other end of the scale were Dactylorhiza markusii and Serapias lingua both only seen as single plants. 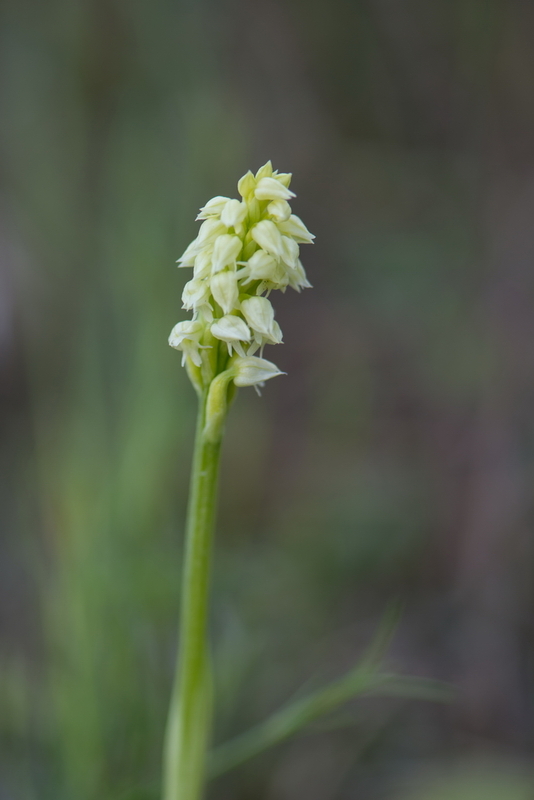 Neotinea conica one of those species we saw as a single plant. Other notes that may be noted is that neither Anacamptis papilionacea nor Orchis italica, which otherwise belong to the most common around the Mediterranean, occurred very often. 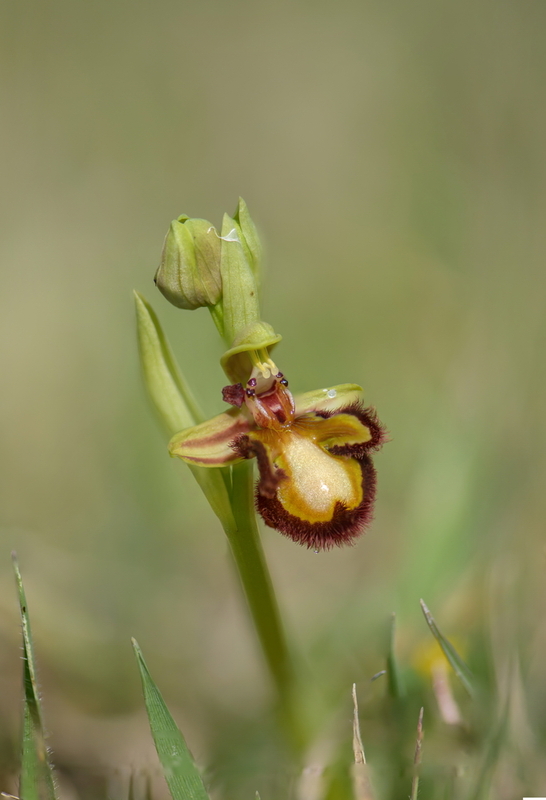 We managed to find all this rare Iberian Ophrys, Ophrys algarvensis, Ophrys atlantica, Ophrys dyris and the recently described Ophrys lutea subsp. quarteirae. 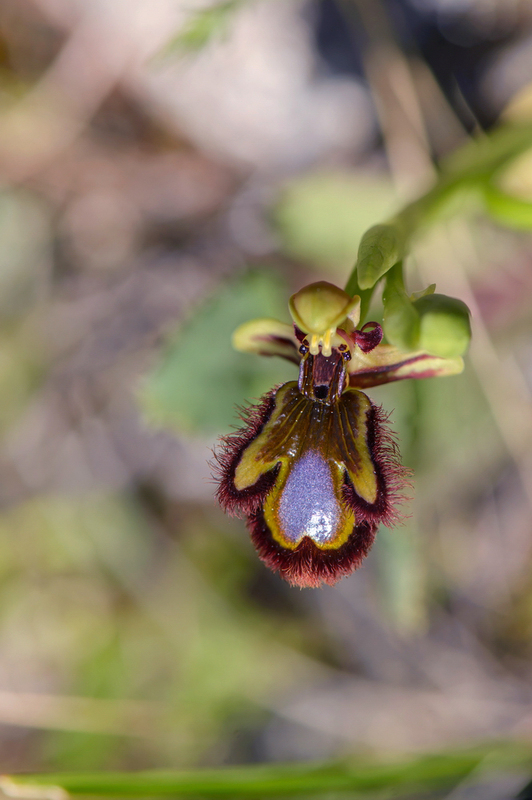 Unfortunately we did not find the other two exclusive species for Spain, Ophrys tentherdinifera subsp. ficalhoana and Ophrys speculum subsp. lusitanica. 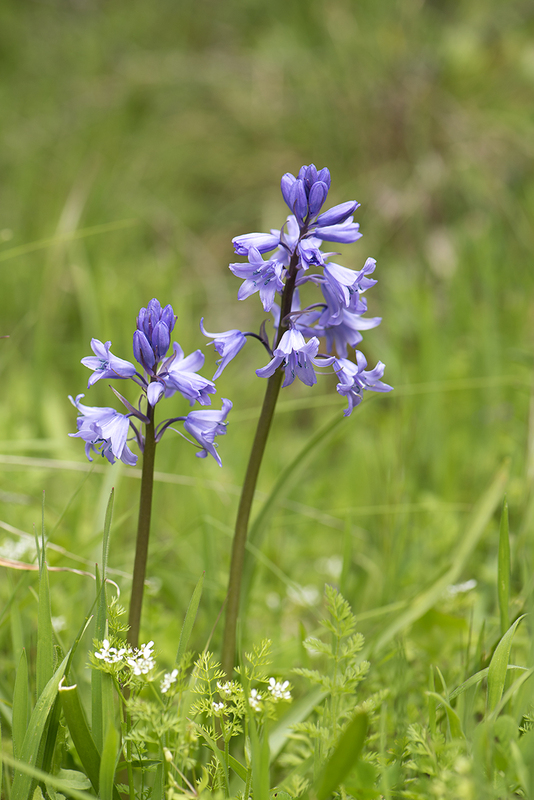 However, this was not expected as these are flowering late April and May. 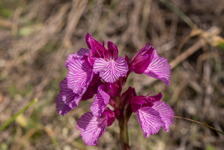 In total we found 34 species plus some hybrids and color varieties. 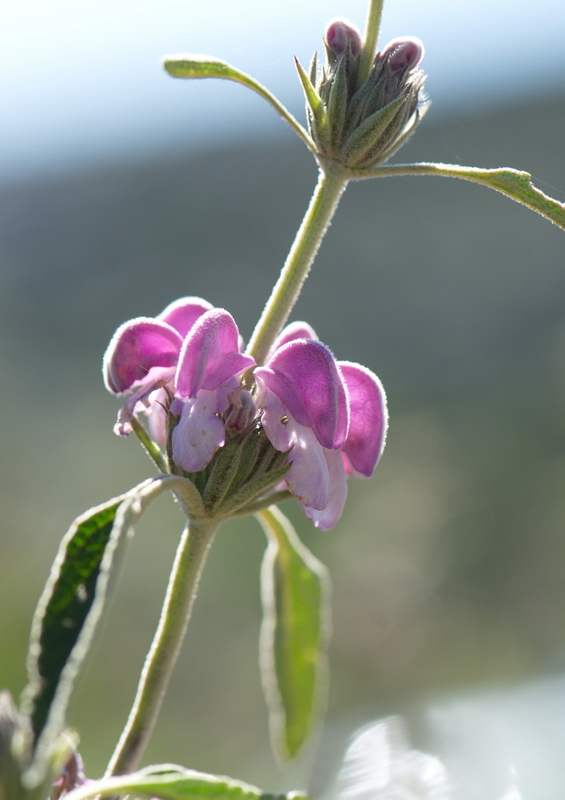 One hybrid, new for us, was O. bombyliflora x tenthredinifera. 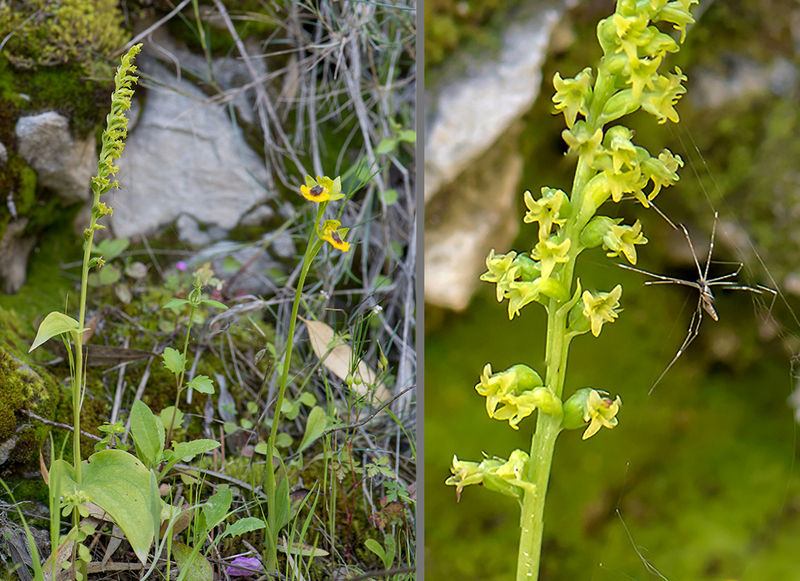 These two species are very closely related but despite that both are quite common, this was the first time we saw the hybrid. During the week, we did six excursions, i.e. one excursion per day. In total we traveled about 860 km (excluding from and to the airport). Below is a summary of the different field trips and what we found. The route went eastward via highway AP7 some km and then up through road A-355, passing Ojen and Monda and further east towards Alhaurin el Grande. About 5 km after Monda we turned right onto a small road (A-7102, exit toward Coin) that went through an area with large limestone quarries. 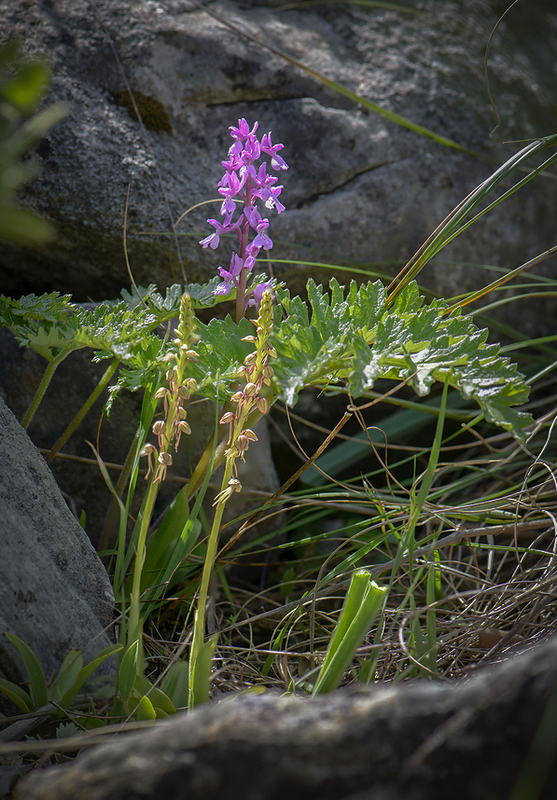 Here, just at the edge of one of the quarries, there had been left behind a small hill with undisturbed, natural vegetation. This was site 1. 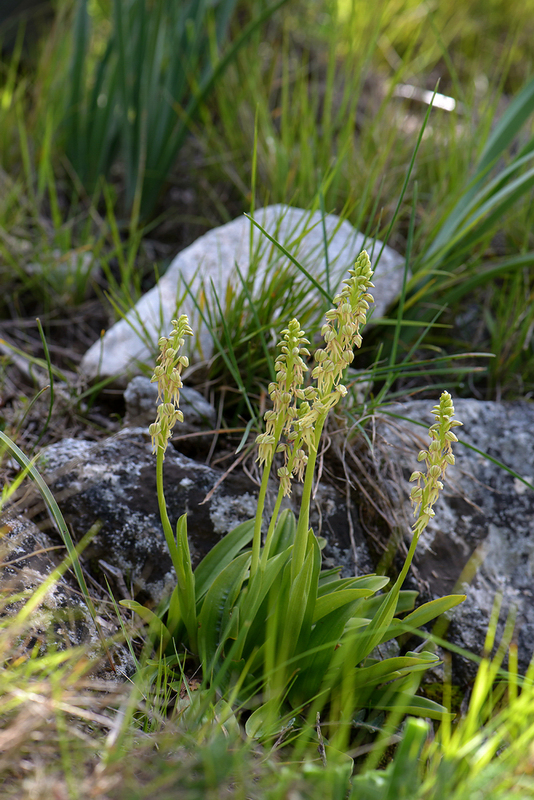 Here we had hoped to find the rare Gennaria diphylla. And we were not disappointed. Even before we stepped out of the car, we could see the first specimens in the slope in front of the car. In spite of the size of this restricted area, we found it as a very rich place with many orchid species. After having searched the steep and somewhat impenetrable slope for a while, we returned to the A-355 and continued east to the next exit towards Coin. But also this time we turned right and drove towards Mijas (A-3303). After about 1.5 km, we passed the village of Urique. About 800 m after the village there was a track to the right. Here we had our site 2, sparse pine wood to the left of the track, and open scrub on the right side. 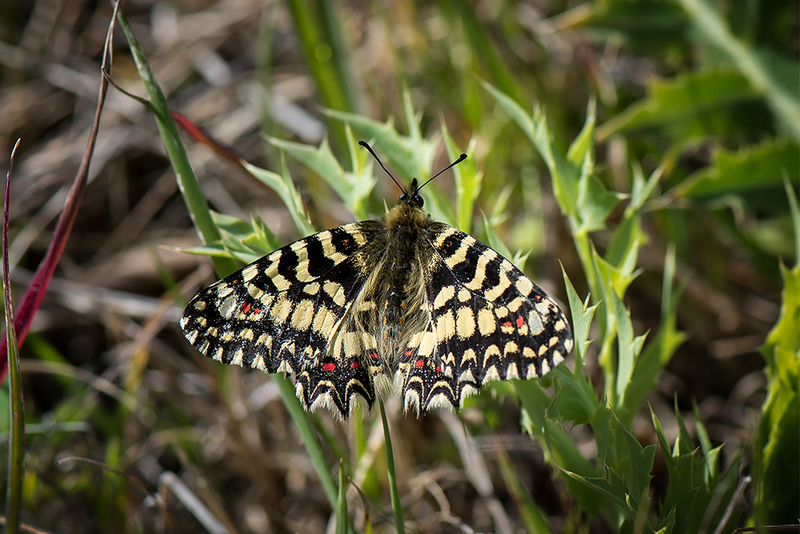 From here, two of Malaga's real rarities was reported, and after some searching we managed to find both. For one, Ophrys algarvensis, this was the only site where we found it. 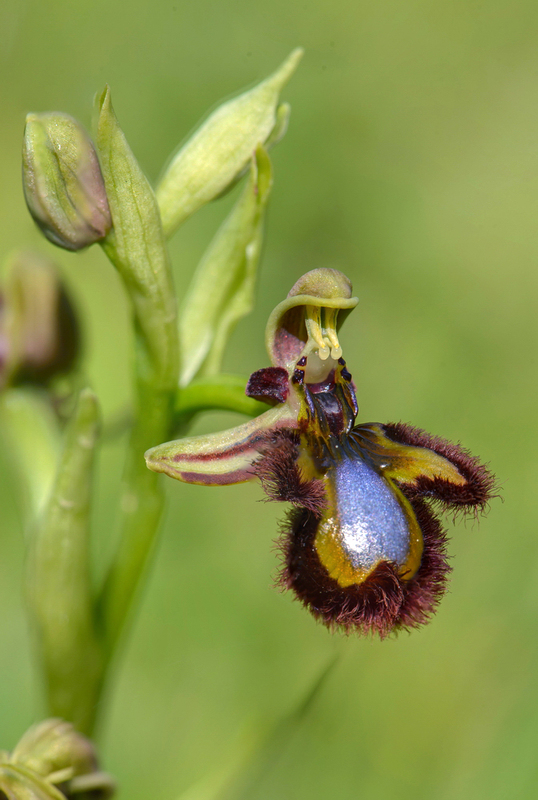 The other, Ophrys atlantica, however, seemed to be more common and we also found this in several places. 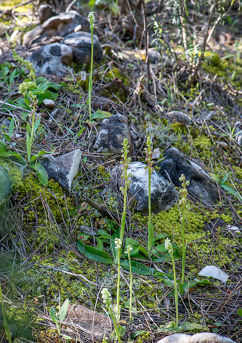 Also a number of other species was found here. Today's third and last site was just southwest of Alhaurin el Grande. 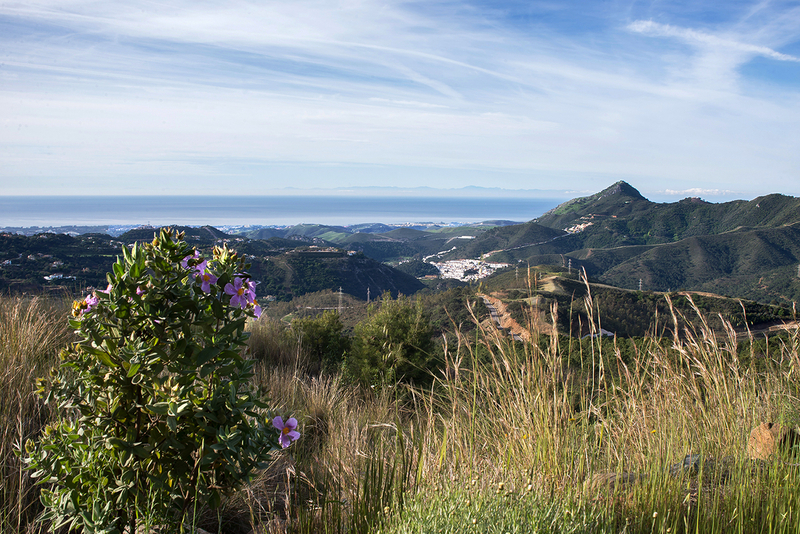 From site 2 we continued the A-3303 towards Mijas and after about 3 km we turned right onto the A-387 (towards Mijas). Here, just 250 m after the junction (roundabout), there was a track up through the slope at left side of the road. This was site 3. Here we took our packed lunch before we began our search. 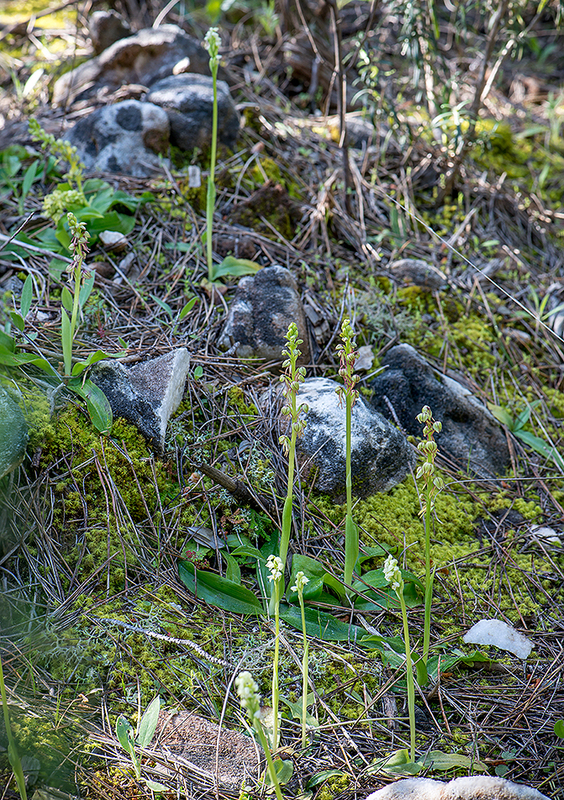 The site consisted of sparse pine forest next to the road, while further up the slope there was a more open land. 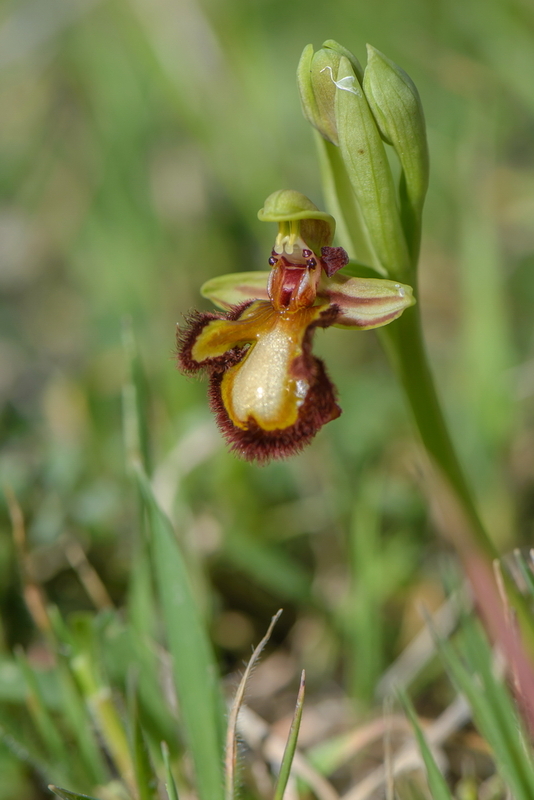 Here we saw for the first time Ophrys scolopax and its small-flowered relative Ophrys scolopax subsp. picta. For Monday's excursion, the route that would take us to the western part of the province, was chosen. The morning was fine with a cloudless sky. We followed A-7/AP-7 passed Estepona and further to Manilva where we took off north towards Casares (the A-377). Today's first stop, site 1 at our map, was made shortly after we took off from the highway. The site was found not to have much of interest. 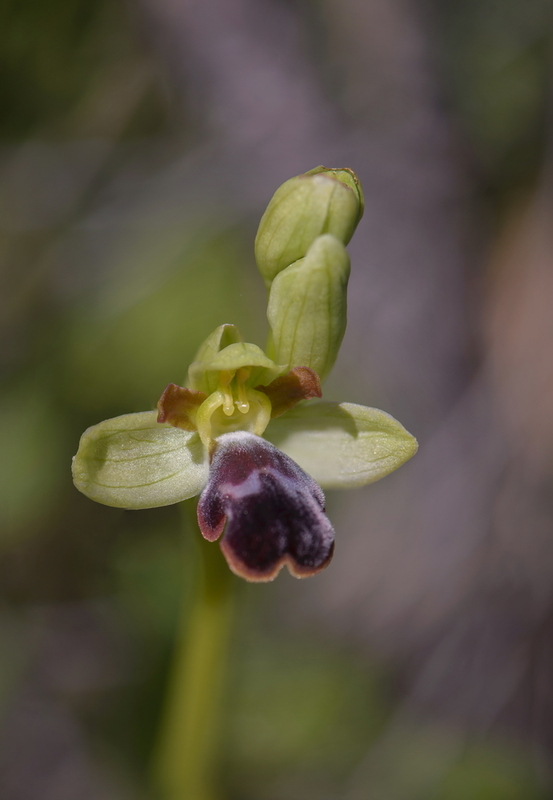 A nice note was, however, a chlorantha-form of Serapias parviflora. The greatest benefit from here was maybe that we was able to study a flock of colorful bee-eaters that flew back and forth in a ravine below the road. 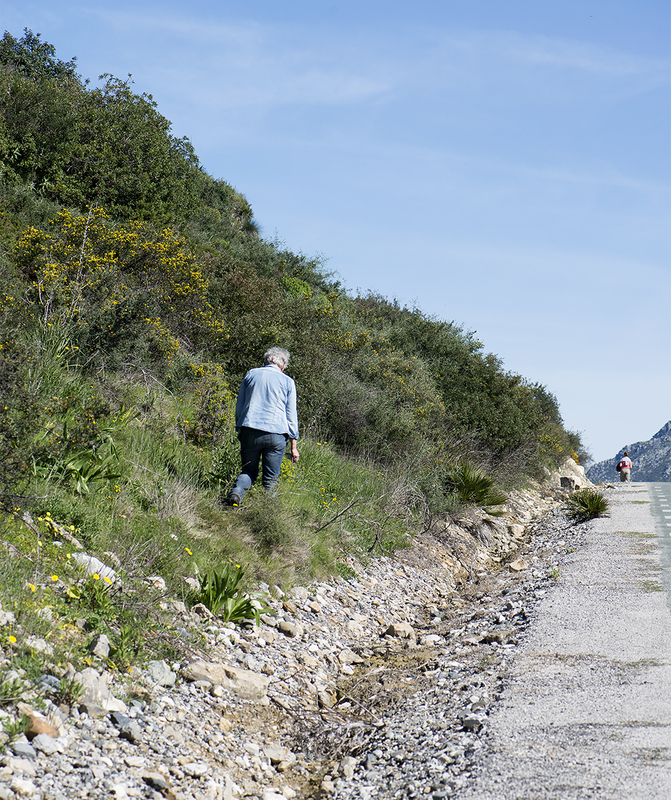 We continued on the A-377 towards Casares. Next stop, about 4.2 km from site 1 may represent the map's site 2. There are several places that looked interesting along this road. We chose this location because of the possibility to park our five cars. Here we could park on a dirt road to the right. The site turned out to be thoroughly grazed so the yield was poor. However, it appeared that the roadsides along the main road, outside the fences, contained a lot of species. 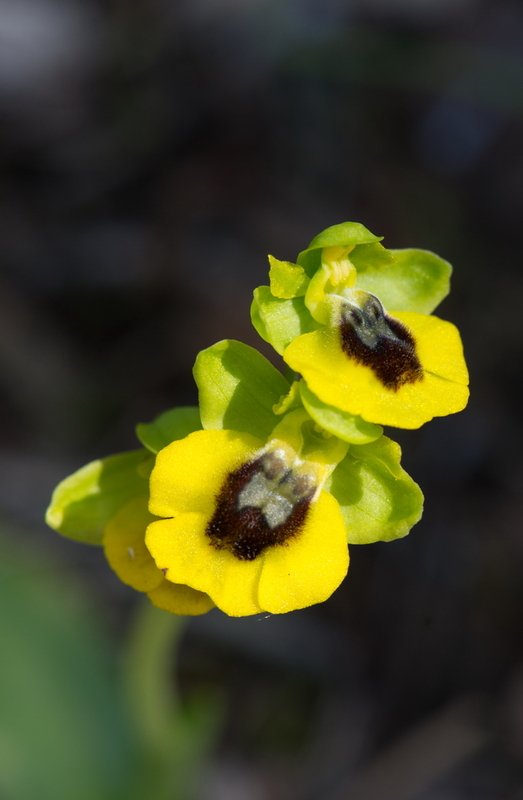 Here we found some plants that looked like O. scolopax subsp. 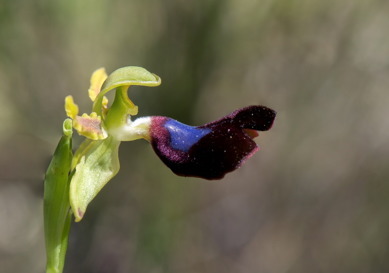 picta but sepals / petals were white. 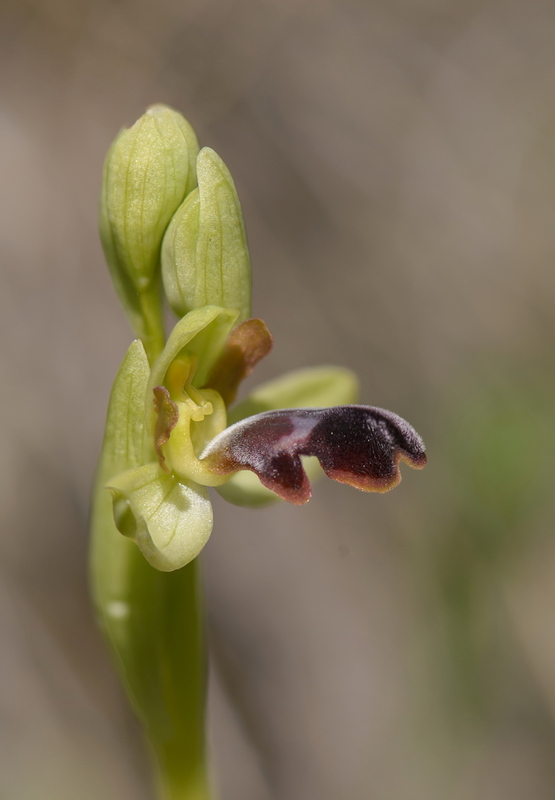 Possibly, this could be an example of what has been reported from Malaga as Ophrys sphegifera. If this is true, however, is highly uncertain. Next stop should be east of the village of Casares. We took off from the main road and drove through the village and into the road MA-8300. Approximately 6 km from the junction at the main road was site 3. 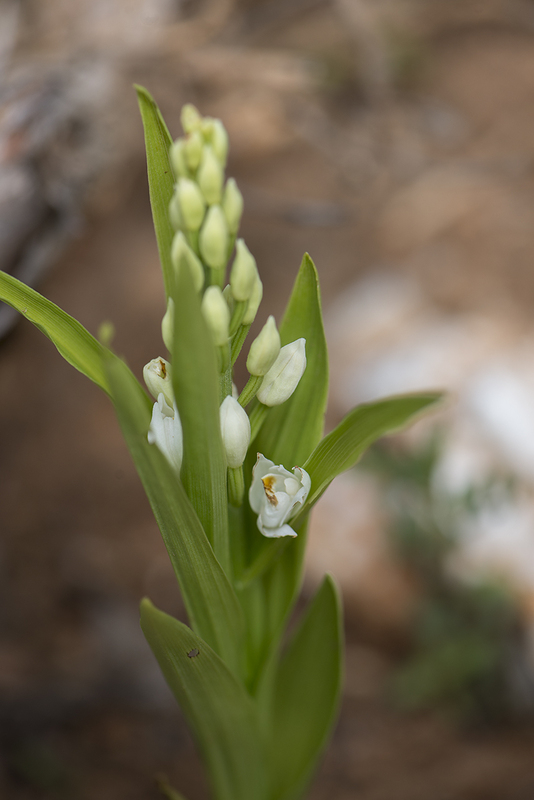 Here in the slopes to the right below the road should Limodorum trabutianum grew, and it did. 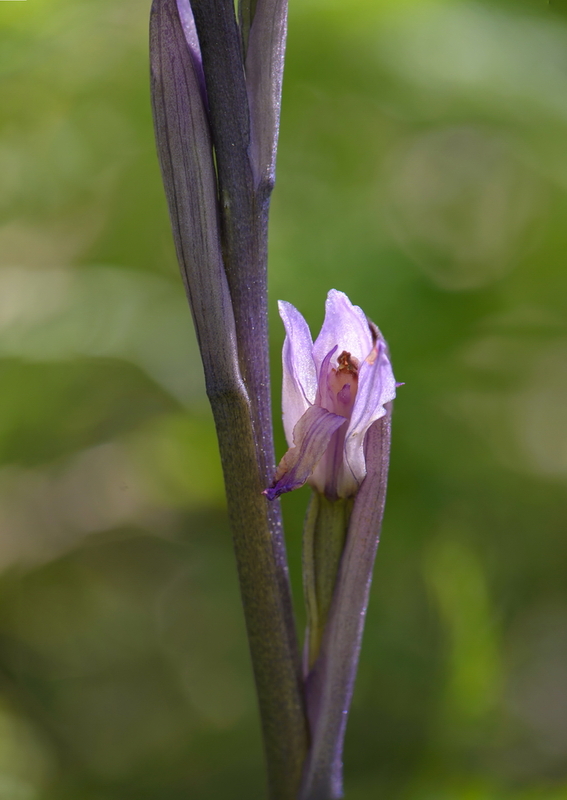 We found a number of the bright purple stems but it seemed that these species were self-pollinated for we found almost no open flower though there was plenty of both buds and swollen seed pods. 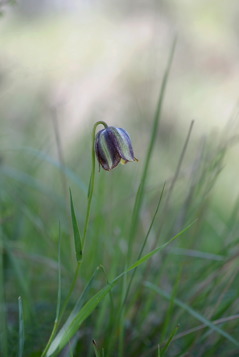 Here also the common Limodorum grew, L. abortivum, which also was flowering at this time. Here we also saw the only specimens of Epipactis seen during our journey, probably E. tremolsii, but at this time year, only with small buds. Below slideshow shows some other species we had found so far. Back on the main road (A-377), we continued on and past the village of Gaucin. Shortly after the village there was a picnic area with lovely views over the valley and the mountain tops down to the coast. 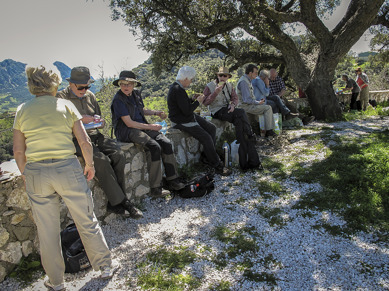 Here, in the shade of a large oak, we had a great spot for lunch before we continued on. Just before the village Algatocin we turned to the left into A-373, signposted to Cortes de la Frontera. Here we had hoped to find suitable areas to search at. Unfortunately it turned out that, except for the problem with high fence along the entire route, the fields that looked interesting was thoroughly grazed by sheep. Anyhow two stops were made with quite a lot of species listed. First stop (other than some futile attempt earlier) was done after about 8 km. Here was a grassy area with shrubs to the left of the road that wasn’t grazed, and therefore gave result. A nice note from this site was the hybrid Ophrys bombyliflora x tenthredinifera (see picture abow in "Summary"). We then proceeded towards Cortes but without finding suitable areas. On the way back we made ​​a stop just before we reached the main road again, about 1.9 km from the main road. 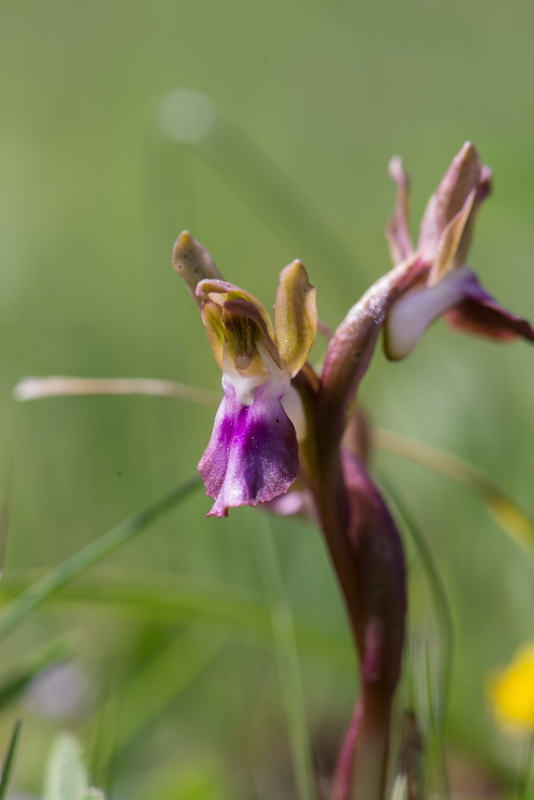 Here in a almost impenetrable, steep and brushy hillside we found our first Orchis olbiensis and Anacamptis champagneuxii. Both these we would see a lot more of later. 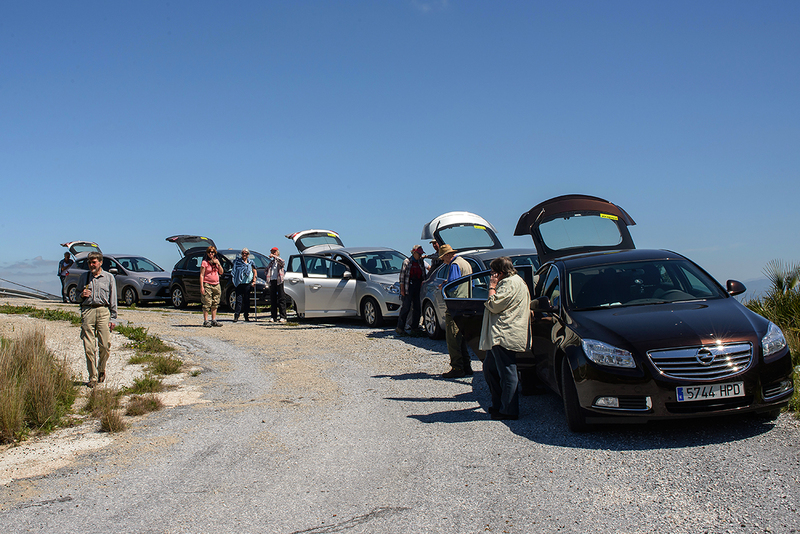 For those who liked to watch birds this stop was a hit since there was a large number Eurasian Black Vulture that sailed in the sky above us. Since we had a quit long way back home, we decided to skip this routes last sites around Algatocin and instead start our way back home. 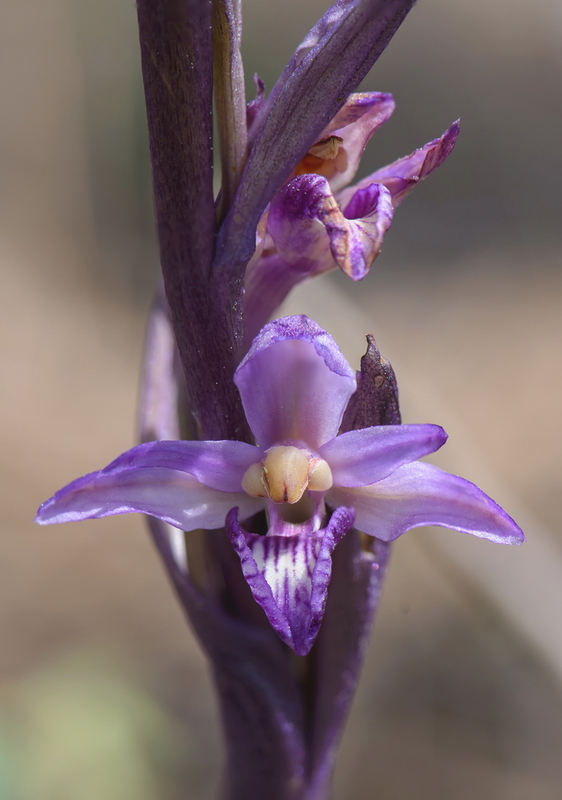 Anyhow one car continued up to the site 7 and 8, and there there found the only Dactylorhiza romana subsp. markusii during our journey. For once, the day began with gray clouds that covered the sky and the temperature was no more than 12-13 degrees. But it appeared that this was temporary, and when the sun rose a little higher the clouds disappeared. Route 3, which was chosen for this day, would lead us up to the old, well-known town of Ronda. We would, however, just pass the edge of the town and went further east towards El Burgo. Our site 1 was at the road up to Ronda, along the A-397. The road passed through the outskirts of the conservation area Sierras Las Nieves and a large sign said that here was a road that went into the area (the only road at this western side of the area). A few hundred meters down the road there was a large open area with parking and picnic areas. 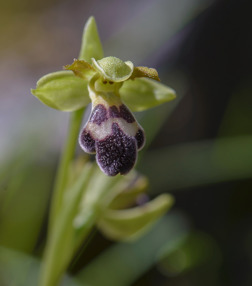 Also from a orchid point of view, this was a very nice site. Here we saw among other Orchis olbiensis in hundreds and in every color from reddish purple to white, all, however, had the typical dark red-purple spots on the lip. 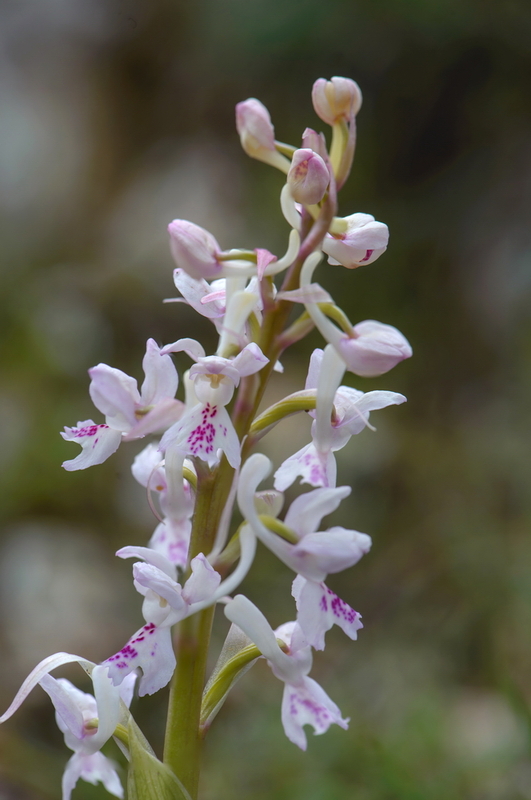 Up here, at about 1060 m, we also found Neotinea conica in full bloom (see picture in "Summary"), a species that at lower levels was completely faded. We continued the road into the reserve and about 1.5 km further on there was a track to the right toward a small pond. 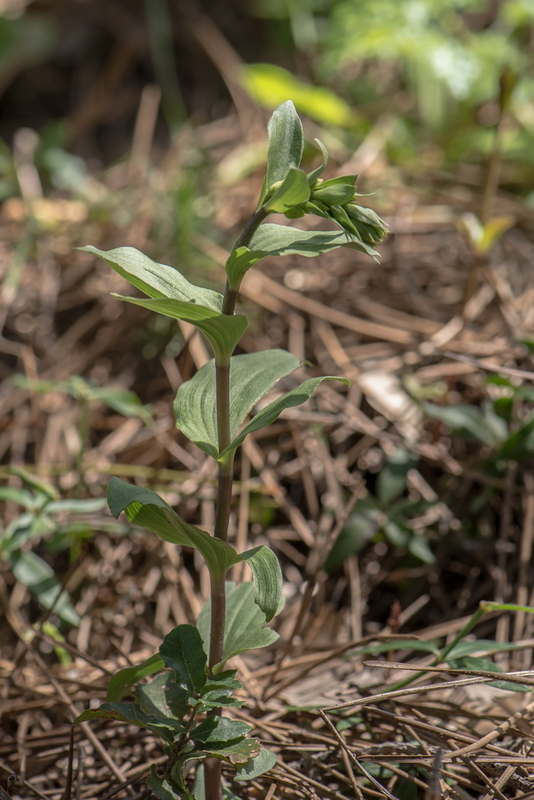 Here along the dirt road we found one of the two plants of Narrow-leaved Helleborine, Cephalanthera longifolium, we saw on the trip. At this altitude it was just in the beginning of its flowering. 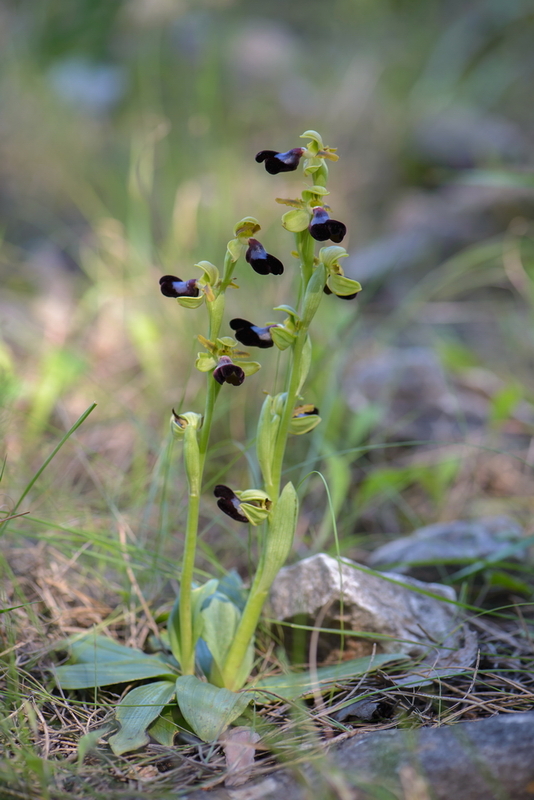 Someone in the group had talked to some Germans who told them that further on along the road there was a magnificent specimen of Himantoglossum robertianum clearly visible at the roadside. This became the next target, and after another 3 km it stood there, a very large, nice specimen and one of the few that we saw of this species. Because of high fence and lack of posibility to park we skipped site 2-4 at the map. 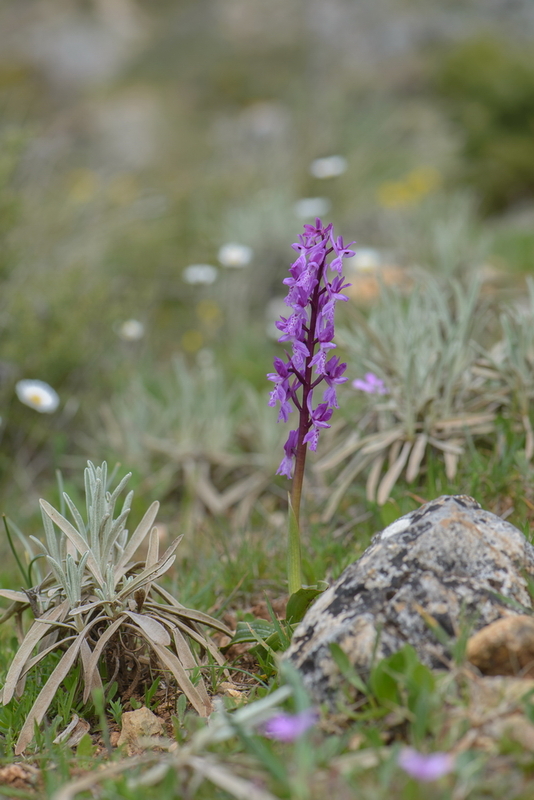 After passing Ronda (the A-366) the landscape raise again to at most 1,070 m, the route sites 5 and 6 along this part of the road did not give many orchids. The area was completely grazed by sheep and goats which we could see in large numbers. However magnificent views could be admired at this open mountain plateau. 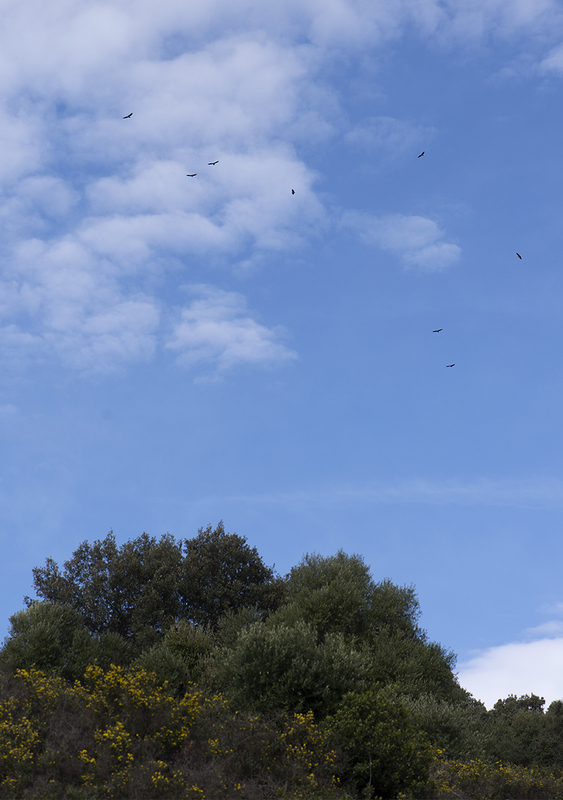 Some vultures and a Blue Rock Thrush were nevertheless highlights from site 6. 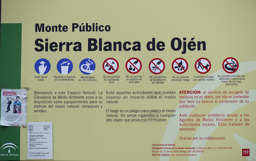 The next site, which was site 7 at our route, was 3 km further to the east, at a large sign that marked that we were at the northern end of the Sierra Las Nieves. The site consisted of fairly steep slopes to the right of the road. 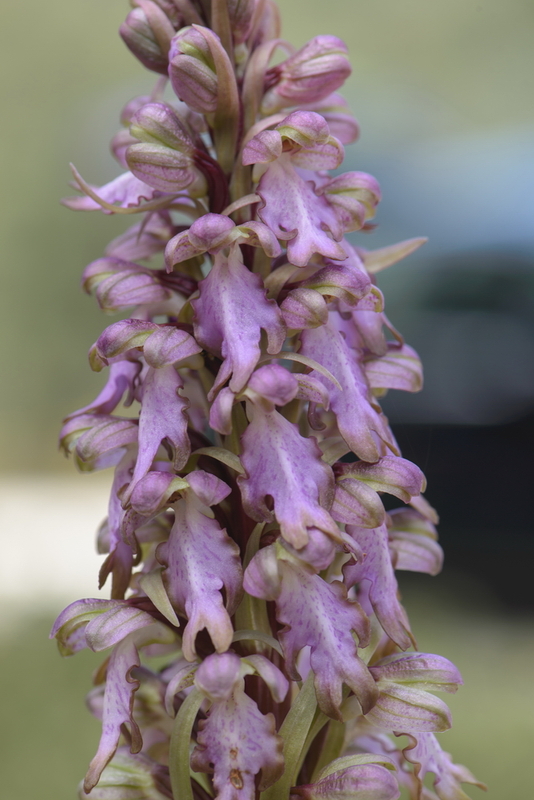 There were a lot of orchids though no news at this time. 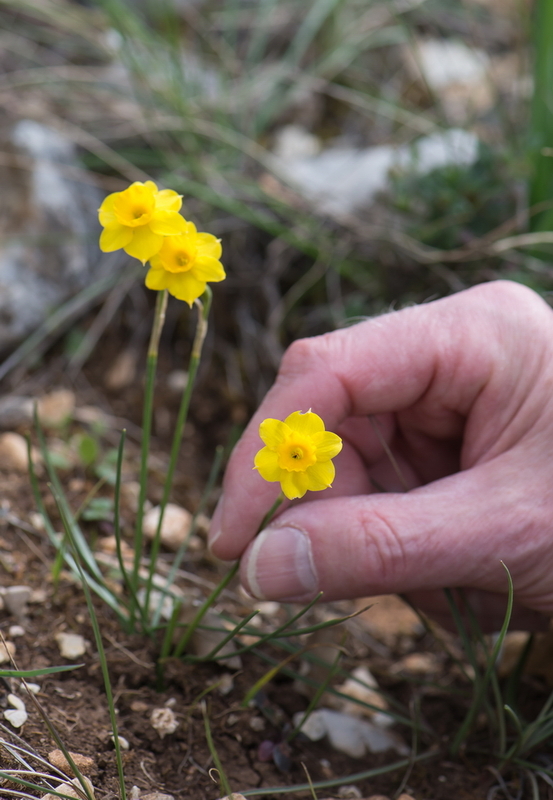 A nice find here were groups of small, "daffodils", presumably Narcissus baeticus (N. assoanus). This was the last stop for the day. We then returned to the hotel the same route as we come. For Wednesday, we chose once again a route that went through lower levels. The greater part of the journey was the same route as Sunday's route but the sites that would be visited this time was further east, between the two cities in the headline. Again the day began with nice weather, with sunshine from a cloudless sky. The temperature came during the day approaching 25-degree mark. We drove the AP-7 and A-355 through Ojen and Monda and further east in an arc around Alhaurin el Grande. Site 1 was right at the eastern edge of the city where the wooded slopes up towards the Sierra de Mijas begins. From the A-404, we drove down a road (street) signposted "Camino Forestal" as far as it was possible to drive up toward the forest. A track then went up through the sparse pine forest. Even an open field, with garrigue-like vegetation adjacent, were searched. 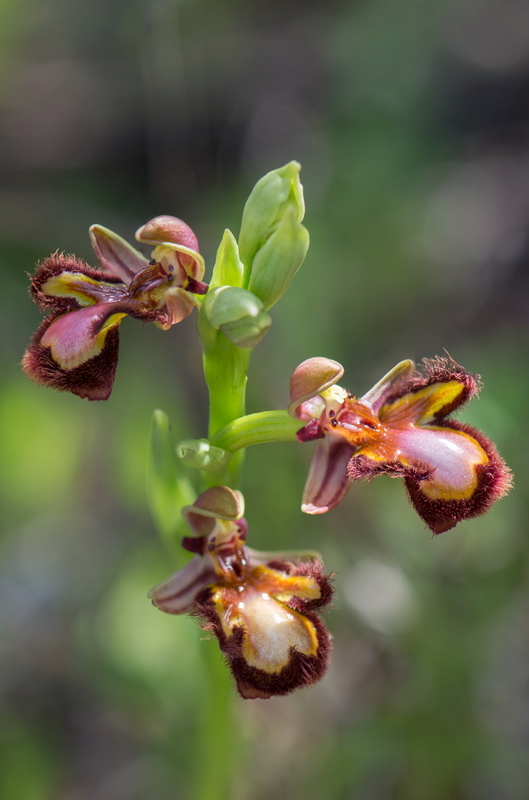 Although no new discoveries were made, it was a nice site with a lot of orchids. We could here see how Anacamptis champagneuxii can vary in color. It was namely in abundance here. Even a hybrid with A. papilionaceae was found in the open field. Back on the road A-404, we continued east towards Alhaurin de la Torre. Here we drove at one side of a shallow valley with cultivated fields and scattered farms. After about 4.4 km, there was a road to the right (probably part of an old road alignment). 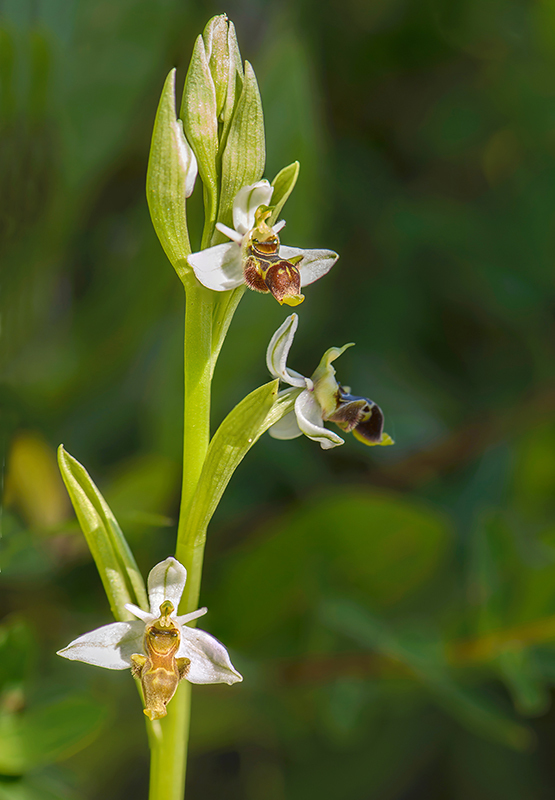 This was the route's Site 2 but it turned out that this wasn't a good area for orchids, except for the usual Ophrys speculum which we saw at almost all sites. The slopes to the right of the road were just too steep to get up there in an easy way. We therefore continued fairly quickly on to site 3 which was not more than about 700 m further on. Here the slope to the right was slightly lower and therefor possible to get up from the road. Nor here we found any new species, but a lot of the ones we already had seen were noted. Those who like fungus could here note an unusual species Red Cage, Clathrus ruber. Today's last site was site 4 on the map. This was another 1.2 km closer to Alhaurin de la Torre. Here there was a road to the right, through a great white portal (Real Sociedade Tiro de Pichon), up toward Mijas Mountains. We followed the road up to the parking lot located at the boom that blocked the road. 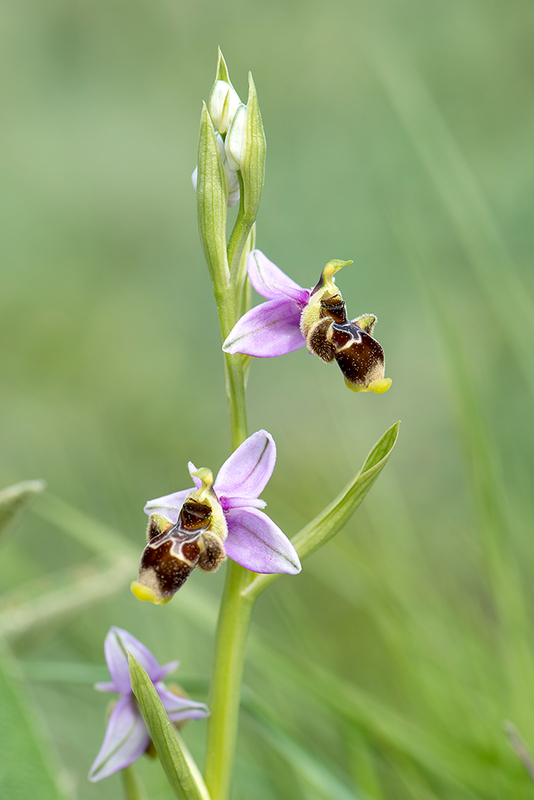 This proved to be one of the best locations for studying Ophrys atlantica. It was here in large numbers. 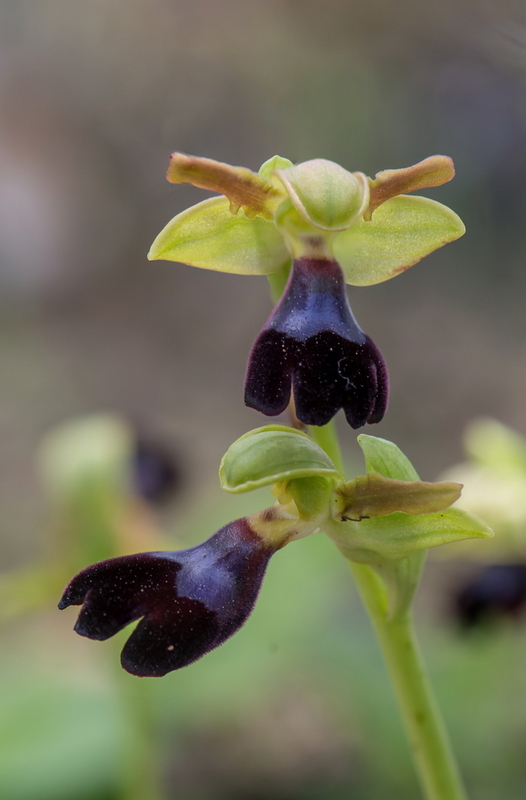 Moreover, they were in their best with robust plants that had up to six flowers. 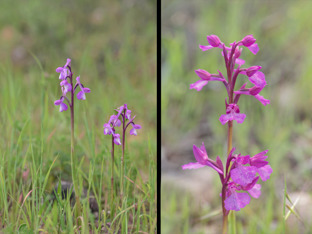 But the most common we saw was 1-3 flowers. Back to the hotel we chose to drive through Alhaurin del Grande and Mijas, down to the AP-7 highway and further to Benahavis, and we was there just before seven o'clock in the evening. But before that we had made a detour at Mijas (site 5 at the map). A road went up to the top of the mountain behind the village, and here we had hoped searching in the lower part. However, we chose the wrong turn-off and ended up in a limestone quarry. But this wasn't entirely wrong either. 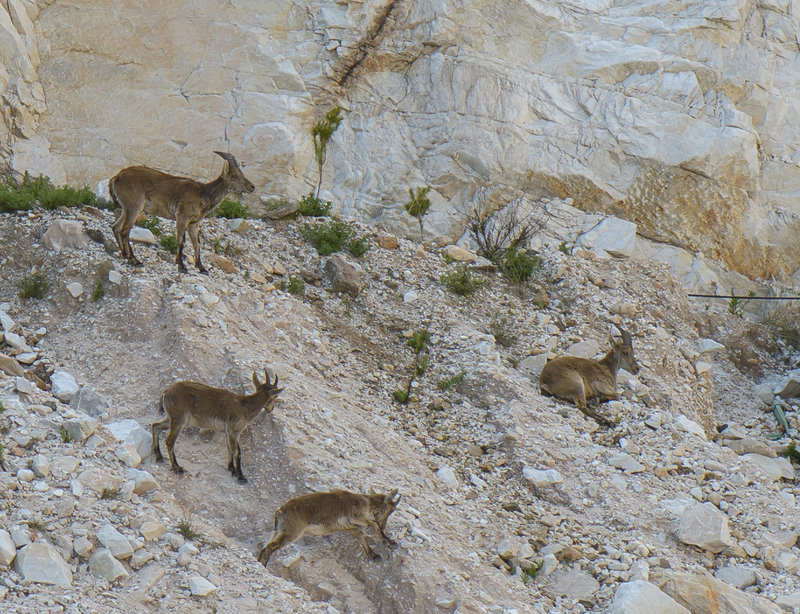 Here we saw a herd animal that climbed around at the steep sides of the limestone quarry. Possibly it could be Barbary sheep, a species that was Introduced in the 70's from North Africa for hunting purposes and which has spread over a wide area in south-eastern Spain. However, this must be verified by someone knowledgeable before I can confirm it. 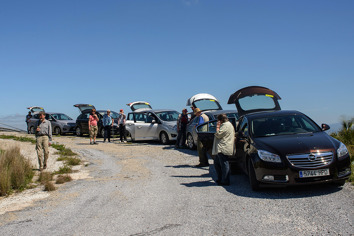 For this excursion one of the cars chose instead to visit Gibraltar. The rest of us chose route 7 which actually was a "resev". It is a long route but we decided to go as far as we thought could be good and then return the same way back. The alternative route was a trip up to Antequera and the area at Torcal de Antequera with its incredible limestone tower landscape. The selected route started toward Ronda and then to the west through the natural protection area "Park Natural Sierra de Grazalema" situated between Ronda and Grazalema. Since we did not want to enter into Ronda we drove in an arc north of the city. Site 1 was between some sharp hairpin bends just outside Ronda. It was somewhat difficult to get up from the road to the area with open pine forest above. 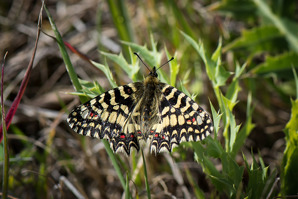 No news was listed here but an example of H. robertianum were seen, one of the very few that we found during our week. Site 2 was in the next hairpin curve that was much wider than the first. 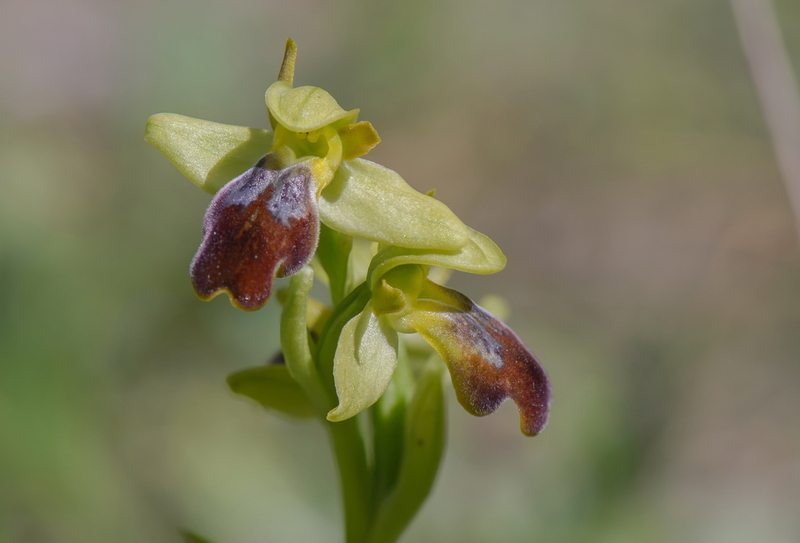 The site did not offer any amount of orchids so we went quite quickly on. Another stop, site 3, without result was about 5.5 km from the 2nd. Here was left an arch of the old stretch of road where you could drive off. It turned out that on the other side of the fence along the road, cattle were grazing and the area looked in generally very well grazed. So we left therefore the idea of climbing over the fence. Next stop was made after that we turned onto the A-372. Site 4 was some 100 m after passing the Km 61 mark. To the left of the road there was a house but on the right side there was a large open area with the typically dry meadow look. Here were no high fences, as it has been along the entire road up here. 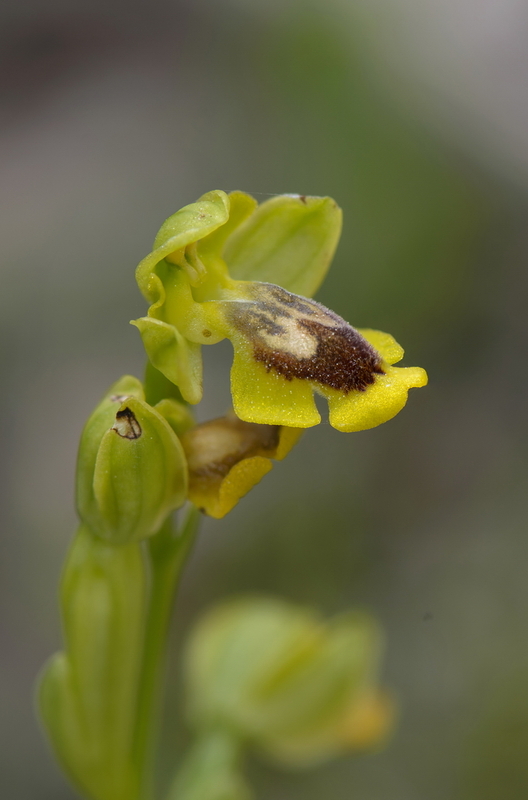 We noted a number of species, but what made the site most interesting was the large amount of O. lutea and especially O. speculum, probably in 1000s. 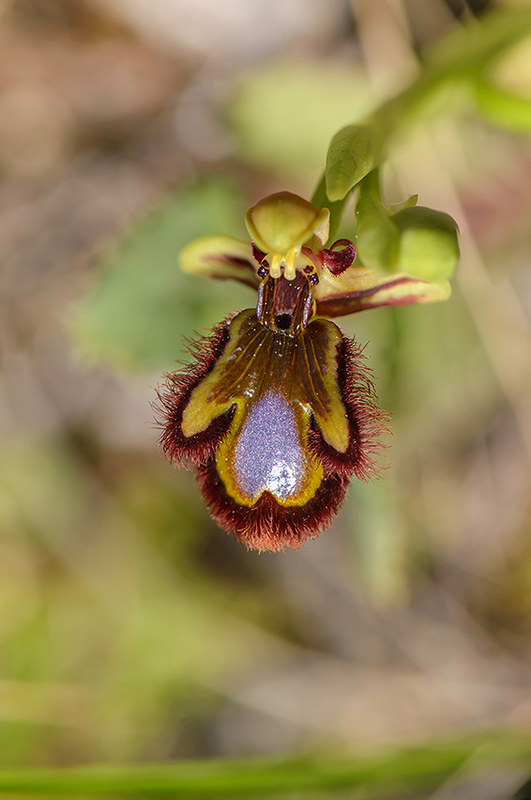 Among others there were a number Ophrys speculum where the blue color on the mirror was missing. The mirror was rather yellowish and in some cases tinged red. This day’s last stop was the map's site 5. Just before Grazalema we met the A-373 and turned left. 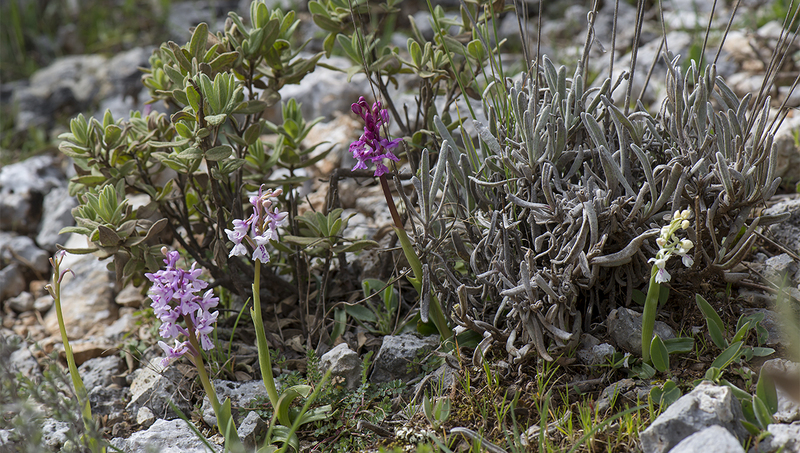 The area called "La Rana" was about 500 m further on, and was a moist, open landscape which seemed pretty hard grazed. 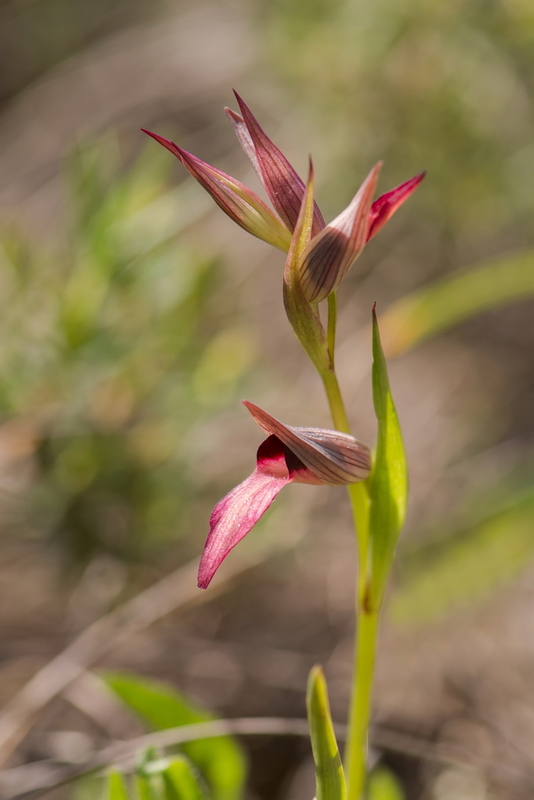 It did not look like it had been grazed during this spring, but here, at about 800 m level, there was not much vegetation at all at the cold, damp ground. 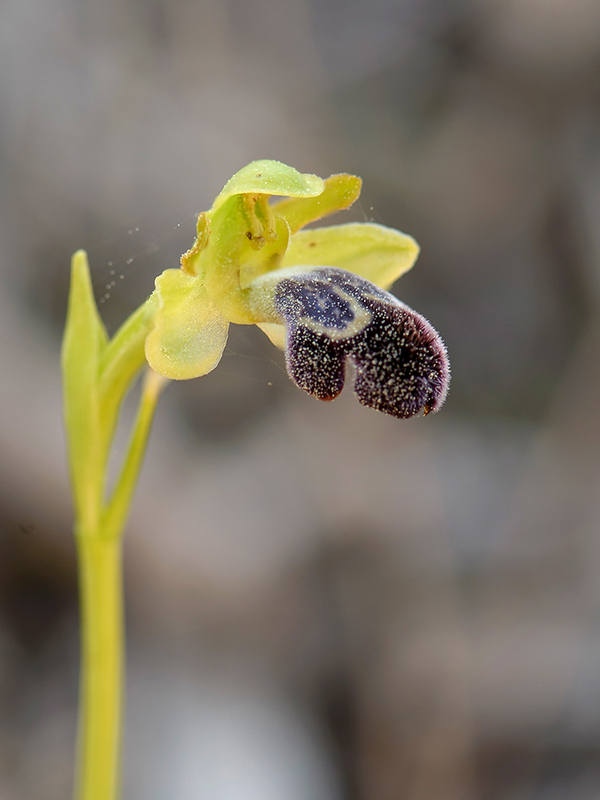 However, some species was found in drier areas. 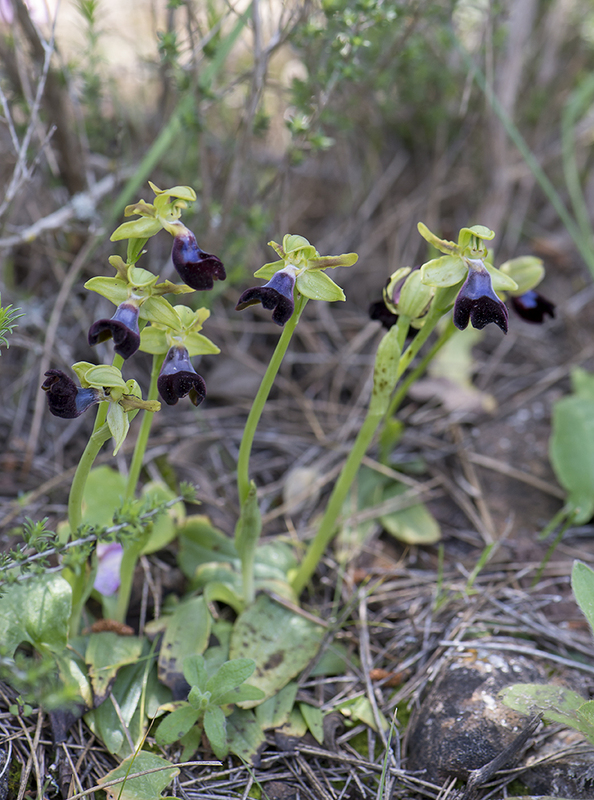 A nice findings was done at the roadside, a Frittilaria-species in full bloom, probably Frittilaria hispanica (F. lusitanica), a species that is endemic to the southern part of Iberian Peninsula. Back at the cars it was decided that we would cancel rest of the route. We didn’t want to be too late back home. One of the cars continued on and completed the planned route. They could later tell us that it was worth driving the longer route. 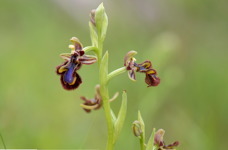 There has been lot of nice views and also more orchids but no new ones. Rest of us turned around and went back same way we come during the day. 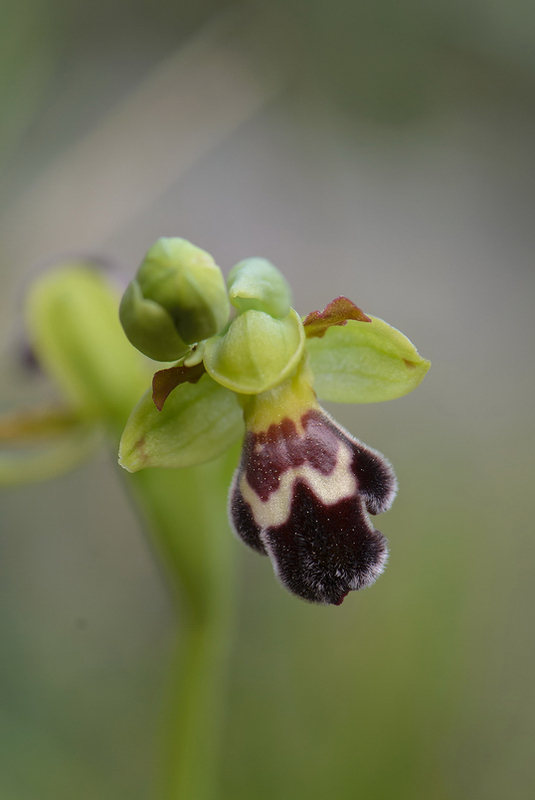 A couple of short stops were made on our way back but without any new species found. Route 1 was saved for our last excursion day, because it would be the shortest. People needed get home for packing, since next day we had to start quite early to get in time for our flight back to Sweden. Again we started along, the now familiar, highway AP-7 and later on the A-355 towards Ojen / Monda. But this time not quite that far. 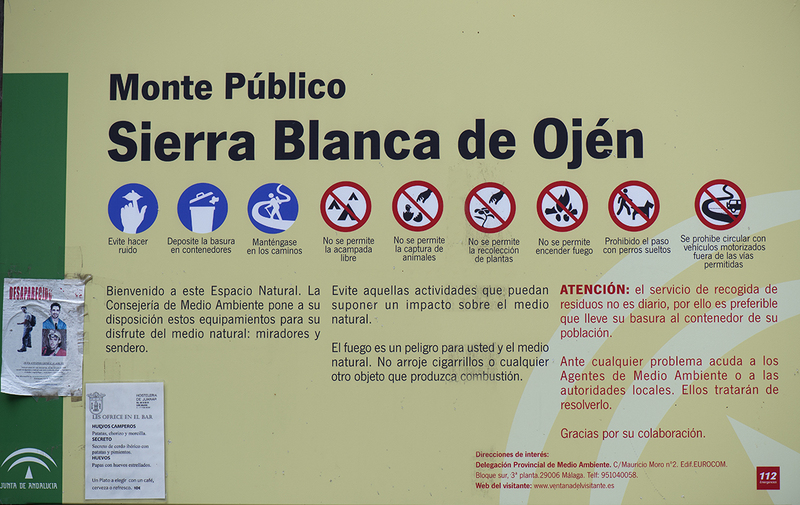 A few km after Ojen we turned left into a narrow path toward the Refugio de Juanar, a recreational / tourist center / hotel up in the Sierra Blanca mountain range at about the 800 meters-level. The weather didn’t disappoint us this day either, sunny and warm, and although we were quite high, temperature passed the 20 degree mark during the day. 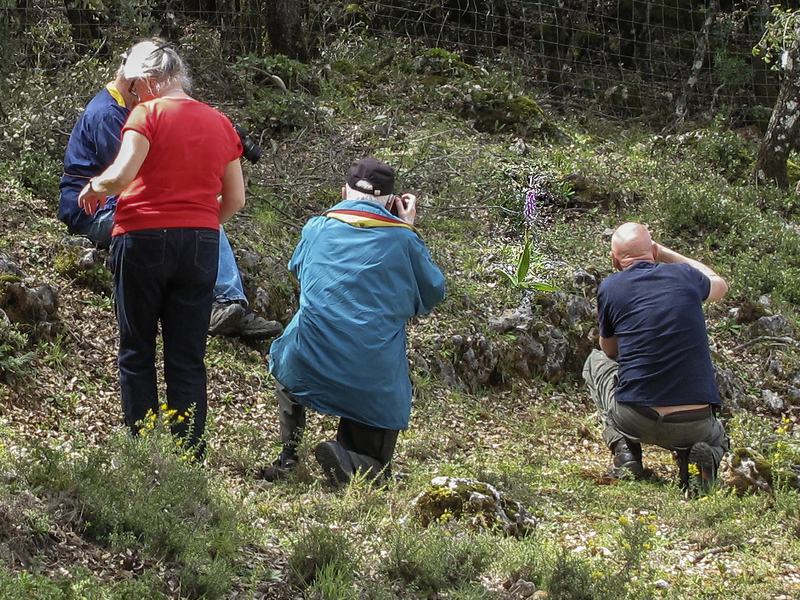 Our last day was dedicated to a visit to the nature reserve "Sierra Blanka de Ojen". Our first stop, site 1 according to the map, was at the 1 km sign after the turn off from the main road. The site consisted of sparse pine wood with some bushes at the ground. 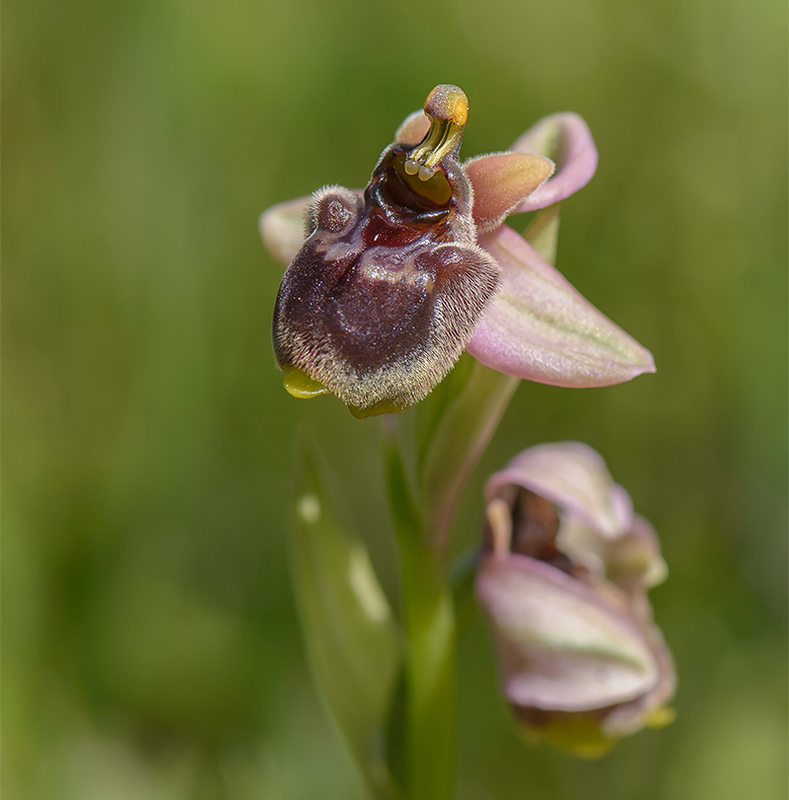 Here we met for the first time Ophrys dyris, the third one of Malaga Ophrys that belongs to the O. omegaifera group. A number of previously found species were also noted, including Neotinea maculata and Orchis anthropophora in large numbers. Site 2 was the slopes to the left of the road just before you reach the entrance to the hotel (at a white transformer building). 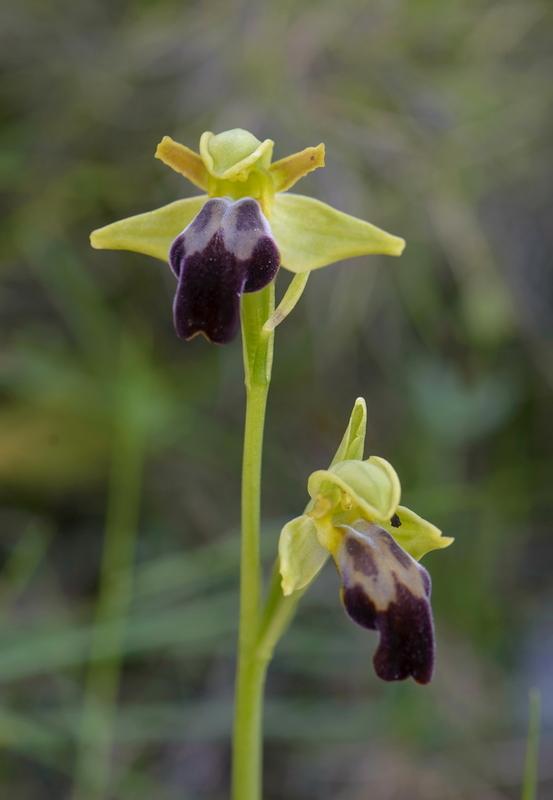 But before we got that far we made ​​a stop because we could see orchids that grew up on the edge of 4-5 m high rock face to the left of the road. It turned out that there were a lot even below, at the roadside. 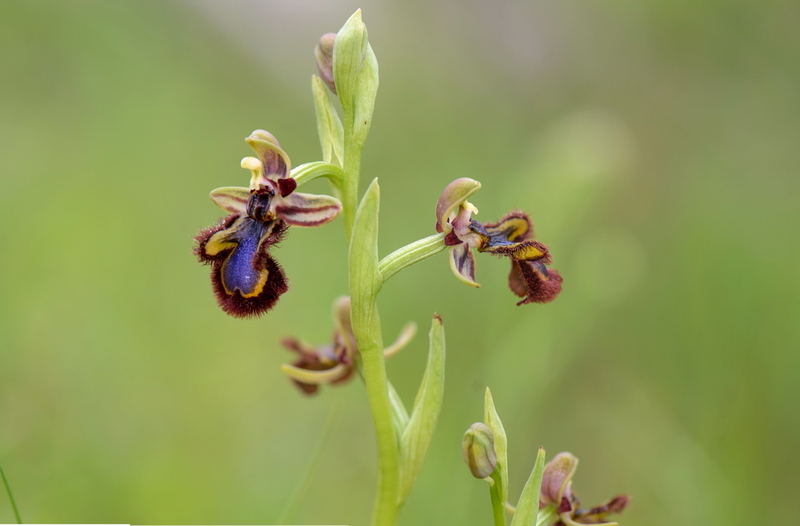 What caught the attention were some splendid specimens of Ophrys scolopax. 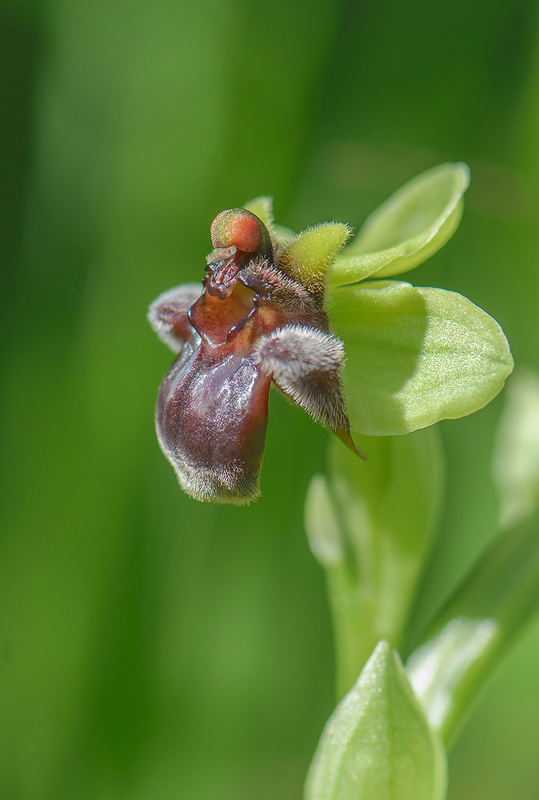 There were also some Ophrys tenthredinifera, Orchis olbiensis and Orchis anthropophora. (These findings should belong to site 4 at the map). Site 2 was shown to have some goodies too. 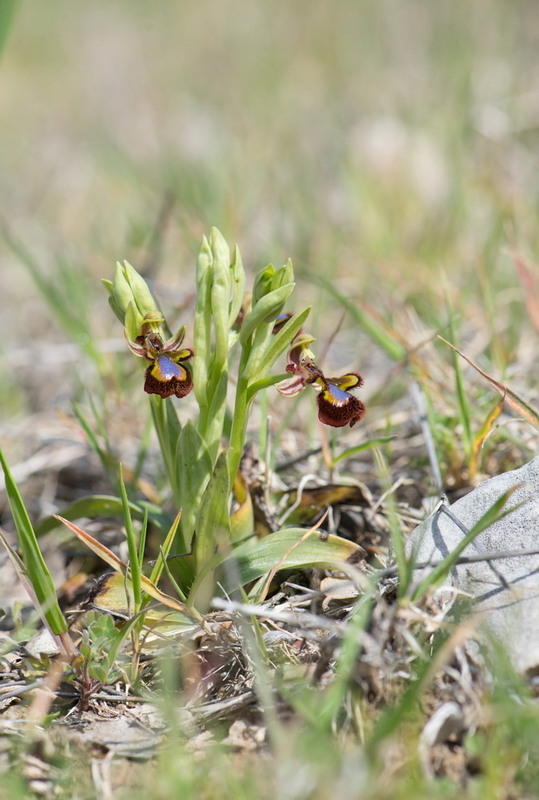 There were several plants of Ophrys dyris but also some Orchis mascula which was a new species for the journey. Site 3 at the map was the area behind the entrance to the hotel up to the barrier, which marked the end of the driveway, a few hundred meters further on. But nothing was found here. By contrast, a quick turn onto the road to the hotel gave us a magnificent specimen of Narrow-leaved Helleborine, Cephalanthera longifolia, just behind the hotel. Unfortunately, up here we also got the journey’s most boring experience when one of the cars was stripped for everything of value. How they had managed to open the locked car is still something no one knows. As the time already was late, it was decided to skip the last two sites from the original route (further up towards Monda) and start our return to the hotel. But since roadsides proved to be so interesting at our way up, we did several stops on the way back down to the A-355 (site 4). At one of these stops, we found another new species for the trip. 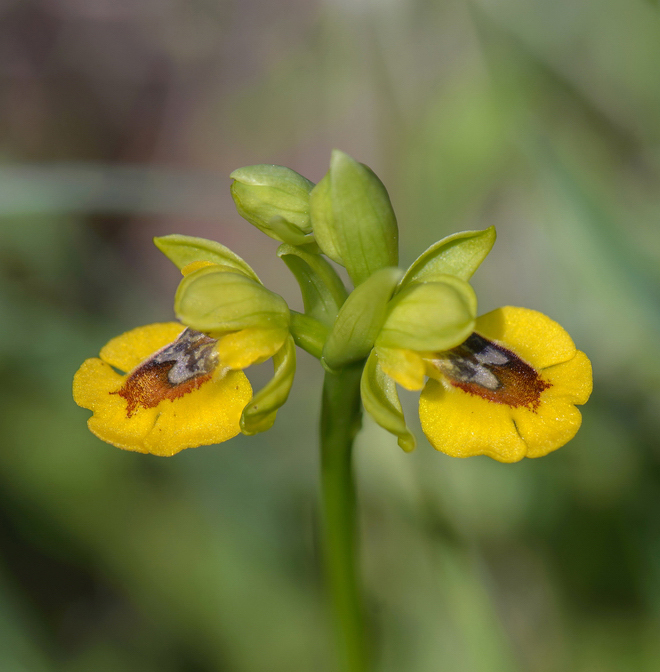 It was the fairly new described Ophrys lutea subsp. quarteirae, a species very similar O. sicula. Except for for the robbery, this last day of our journey was, as the days before, a really nice day. Even this day we had counted new species. In summation of the trip, during our last dinner in the evening, it was found that the journey had been very successful. Both in terms of number of found orchids and weather during our days here. Perhaps we were particularly pleased about the very beautiful landscape, we have been able to visit. 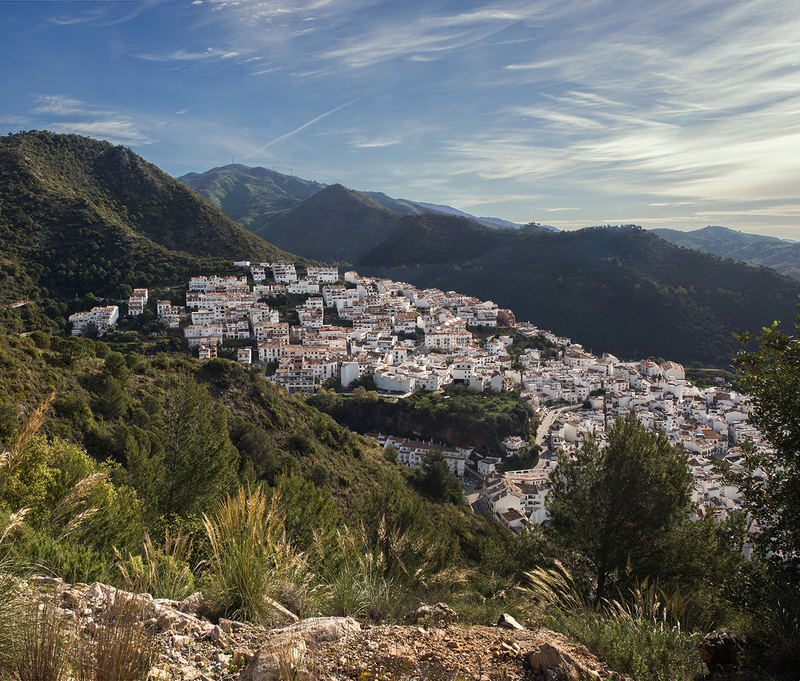 With this experience, I can highly recommend a visit to the Andalusia region.